Wash and soak rice and fenugreek seeds. Similarly wash and soak black gram and bengal gram. Soak them for 6 hours—preferably overnight. When soaked remove water from them and grind to a fine paste. You can use mixer grinder or wet grinder to grind this. Then mix both the pastes and add salt to it and mix well. Take this into a deep bowl and keep aside to ferment. Preferably keep this bowl on a big plate---because after fermenting the size of the batter increases and it may spill over the bowl. Wash the potatoes and take them in a bowl. Add water and pressure cook them. Just before the pressure develops in the pressure cooker and it is about to whistle make the flame low and cook for 15 minutes. Then, after 15 minutes, make the flame high and before it whistles switch it off. With the pressure inside the pressure cooker the potatoes will be cooked completely even after we remove it from flame. When cool remove the vessel from the cooker and allow the potatoes to cool. Then peel the skin off from the potatoes and keep aside. Peel the onion skin and cut it into thin slices. Wash and chop the coriander. Heat oil in a pan. When the oil is hot add the black gram and fry till it reaches golden brown colour. Then add the mustard seeds followed by cumin seeds. Fry them well. Now add the curry leaves and chilli ginger paste and fry well. Now add the sliced onions and fry till transparent. Now add the turmeric powder and salt. Mix well. Finally add the potatoes by mashing them with fingers. Mix well till the curry is uniformly coated with the turmeric colour. Now add some coriander leaves and mix. Cook for one minute to bring the nice flavor out of the coriander. Transfer this to a serving bowl and garnish with the remaining coriander. Heat a flat pan. Take a ladle and mix the batter to check the consistency. If it is too thick add some water. Add water little by little and mix. If more water is added and the batter becomes thin we won’t get good dosas. When the pan is hot take a ladle full of batter and pour in the centre of the flat pan. Then immediately start spreading it in circular motion to get a thin layer. Now add oil and spread this over the dosa with a flat dosa ladle. All this you have to do in few seconds—otherwise the dosa will be like a lump in the centre of the pan because it is getting heat from the bottom. So fry nicely till golden brown. Just before removing add a ladle full of curry in the centre of the dosa and fold it. Serve this hot with coconut chutney and ginger-tamarind chutney. end till you get a nice cone. Take a serving plate and add a ladle full of curry in the centre of the plate. Above this curry make the dosa stand in the plate and serve---your guests will be impressed. I saw your recipe on the internet. I want to know the right recipes for idli and masala dosa-----which rice----sela,parmal sela, kolam, ponni, idli rice or south indian basmati or ANY OTHER and what ratio of dal and rice. When I make dosa, even though it is well fermented ( natural fermetation in summers and yeast fermentation in winters in Delhi ) when I spread batter on tawa there are no holes and the surface has a cracked appearance. Please guide me what goes wrong. I have tried 2 cups raw and 1 cup boiled rice and 1 cup urad dhuli dal AND vice versa-- 2cups boiled and 1 cup raw and 1 cup ma dhuli dal and other ratios. What ratio should I try because I do not want too thin brittle papad like dosa. Also,please tell me how to make tasty idli. Thereis no flavour in idli,dosa I make.WHICH RICE SHOULD I USE AND IN WHAT RATIO? I hope you will reply at your earliest convenience and oblige. I use Idli Ravva. If you have a friend from Kerala or Tamilnadu, you may ask them where they get their items for Puja and festivals. They have some shops where they sell specific items for south Indian Recipes. While in Bhopal I used to depend on one of these shops for Idli Ravva. Ofcourse Big Bazar and Spencers were not there when we were in Bhopal. Spencers Super Market is also a good place for you to try for Idli Ravva. You have indicated the dosa is getting cracks. It may be because the batter is a bit thick. Try adding a little water. In fact if water is less, fermentation takes longer time. 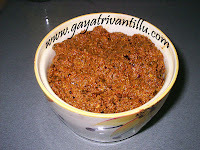 Gayatri garu, great recipes online, very easy to use. In masala dosa video, did you use a nonstick pan or a cast iron pan? Also which brand is it and where can I buy it? I've been trying several pans but with little luck. I made dosa as per your recipe...the dosas came out really good ...i am thrilled :) and am sure my husband will love them. I don't have a wet grinder yet (plan to get one on my next trip to India) and have been skeptical about making decent idlis and dosas using a blender...but this time they came out really nice and crisp (the fermentation process was successful). Thank you so much for posting your recipes. i m surprised to know that u stay here in India. thanks for the recipes. 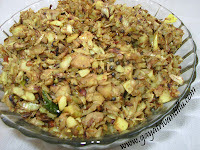 mee voice chala spastam ga vundi...dosa recipe kuda pettaruu..pls..
congrats for ur great job! Nenu eemadye mee website chusanu. 2 varieties try chesanu. baga vachayi. meeru chebuthunte intlovallu chebuthunnatu vundi. meeriche tips kuda chala bonnai. like cabbage stock rasam, tamarind in deep fried oil etc. mee website chala bondhi.chala hardwork chesaru. great work to help others. This site is really helping a lot.Every thing is very good. mee site lo choosi masala dosa , mirapakaya bajji try chesanu. First attempt lo chala chala baga vachayi...ma husband kooda meeku many many thanks cheppamannaru.